Obviously the biggest thing we learned was that Bernard likes Phil Collins. Nice payoff to Sawyer and Kate discussing Mix-Tapes. Also a nice reminder that Bernard and Rose ARE still on the island. This is probably because they will be resurfacing in an upcoming episode. So we learned a little more about Kate's attraction to both Sawyer and Jack. It would seem that every time Jack chooses the OTHERS over Kate, she aggressively runs into Sawyer's arms. Some might even say she is "USING Sawyer" for what she can't have with Jack. Loved the Kitchen scene and the Ping-Pong scene where Kate and Sawyer were respectively acting like they were in high school trying to cut the tension with Jack. Only to see their frustration when Jack doesn't even care! (but who are we kidding? He cares!) The big question is..what's going on with Jack and Juliet? Is Jack really attracted to her or is he under the ol' "Keep your friends close, keep your enemies closer" mantra? We have to hope this is what's going on. And I have faith that it is! Favorite Sawyer line "You guys playing who's your favorite OTHER?" Speaking of the Ping-Pong between Sawyer and Jack...that was a good time. Always like seeing these two competing in some way. But things are definitely a little too lovey dovey between these two right now. That can't last, regardless of Sawyer professing his friendship to Jack at the end of season 2! Something tells me this Kate tension is eventually going to create some friction between Jack and Sawyer again! In Desmond's past we follow his journey to becoming a monk and learn exactly why he is trying to become one! Some interesting tidbits below! 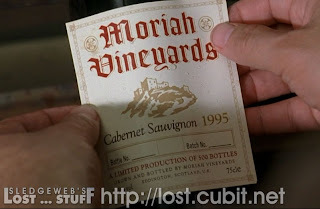 Lots of discussion about the Moriah Vineyards wine. Desmond learns a lesson about sacrificing and being tested. The story is of God asking Abraham to sacrifice Isaac in order to prove he will go to the greatest lengths to serve God. Moriah was the mountain where this occurred. It parallels Desmond willingness to Sacrifice Charlie to find Penny. But in the end, he couldn't. And my Old Testament memory is a little hazy, but I don't think Abraham really DID sacrifice Isaac. It was merely just a test. Kinda like Ross being willing to drink the fat for Rachel! (Yeah...I don't usually pull in Friends references, but that was a good one, wasn't it?) Also, if you want to get technical, the label of the wine says Eddington, Scotland. Apparently this town doesn't exist. I don't think that really matters! But the year says 1995, this was 9 years before the crash and 6 years before Desmond went on his sailing expedition and ended up on the island. Probably worth noting that we know now why Desmond always calls people BROTHER. He was almost an official member of the Brotherhood of Monks! It would seem that the theme of Desmond's life is running away whenever he sees a new opportunity. It is driven into his head that he is destined for great things. We see the pattern repeated when he returns to his ex-fiance Ruth and explains why he left a week before the wedding. The strange thing that happened here was that he said he looked up and asked (God?) if he was doing the right thing. Then a piece of his timeline is missing and the next thing he recalls he is lying on his back in the middle of the street with a monk reaching his hand out to Desmond. The "lying on his back" and "time missing" started making me piece things together. Remember when Desmond turned that Fail-Safe key....the next thing HE remembers is lying on his back in his Apartment with Penny reaching her hand out to him. Are we meant to thing that this was another instance where there was some kind of flux in time? Maybe this is another event where Desmond will end up going back to redo something? But according to him, he's ALREADY experienced it? We get more into the time travel stuff in the next section...It's driving my head bonkers! But I thought this was worth noting. But I guess we're meant to believe that there was a series of events that Desmond ran away trying to discover what great thing he is destined for. And we are meant to believe that pushing that button is the great thing he is running towards. Left Ruth for the Monastery, left the Monastery for Penny, left Penny for the Military, left the Military for Prison, ran away on a sailing trip to prove his worth to Penny's father....ended up on island to push the button. Now he is in the SAVING lives business. Crazy stuff! It would seem that Desmond's life is safe for season 4 because there is much more left to explore with this guy! Thought it was interesting when Ruth said to Desmond it was a good thing a "SHEPHERD" didn't reach his hand out to help him up. Anyone else thing of Jack Shephard? And remember when Desmond helped Jack up at the stadium? Then said "You have to lift her up, Jack" referring to the infamous ankle? Not sure if it was tied together..but it would seem so, wouldn't it? And of course the little easter egg in the final discussion between head monk and Desmond shows a picture on the monk's desk. The picture shows this monk with the crazy lady that knows the future from the Jewelry store! The picture is very photoshopped, but I'm guessing this is because they only casted this lady for the one episode and didn't bring her back in for a picture. So what does this all mean? Is it a large conspiracy to instill in Desmond a sense of purpose? Are they all in on this bending of time? Or their mission to get him to the island? Or is it just another case of lives crossing in the past? I would say there is some significance to the Monk and Clock Lady's relationship. And now it would seem that this lady IS a real person and wasn't just in Desmond's head. As we stated before, we also see Desmond meet Penny after getting kicked out of the brotherhood. They hit it off immediately and the love story for the ages begins! Well everyone has heard the expression "Catch-22." Everyone might not know that it was inspired by Joseph Heller's novel Catch-22. I could get into crazy details about what the book is all about, but honestly, I forget! (plus, I only saw the movie version!) Here's the Wikipedia Synopsis. Basically, I recall that the story takes place during WWII about a pilot who crashed on an island. But the story is revealed to us out of order and from different character perspectives! 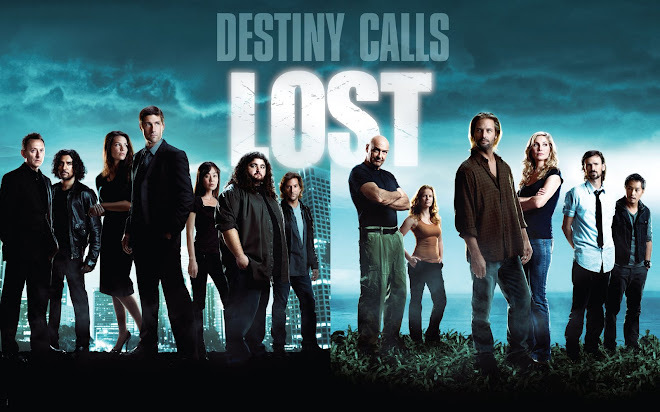 Sounds a little like the show LOST itself doesn't it? I believe this episode was simply meant to be an homage to the novel. 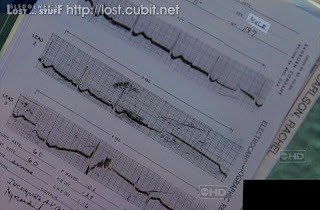 Plus, the expression "Catch-22" is often used to describe a "No-Win Situation" which is what we find Desmond in the middle of when he has to choose between saving Charlie and finding Penny. Let's dive in! Loved Desmond's method of getting the First Aid kit from Jack. Why wouldn't the doctor take a look at Desmond's ankle? Because Desmond took care of JACK's ankle when they were running the stadium steps in their Pre-Crash lives. Thought that was a crafty little reference. Some funny moments. Everything revolving Jin and his love for Camping. "Everybody Loves Marshmallows," Jin telling a horror story in a woman's voice, the Superman vs Flash Discussion between Hurley and Charlie, all good stuff! Bottom Line - Desmond was so adamant about finding Penny, he was willing to let Charlie die in the process. He felt that if he changed ANY details from the vision that he wouldn't be able to get to the PRIZE (which in this case was a vision of a pilot hanging from a tree with their parachute). When it came time to make that decision though, Desmond could not resist saving Charlie. So how about that Helicopter? Did it really find the island? Is that really what crashed? If we go with that theory...then what made it crash? Is there still some electromagnetic force around the island that brought the plane down? 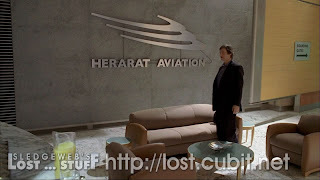 Does that give Desmond some reprieve on causing Flight 815 to crash? (meaning..maybe he didnt?) Very interesting stuff, and maybe we'll get some details in the upcoming episodes! 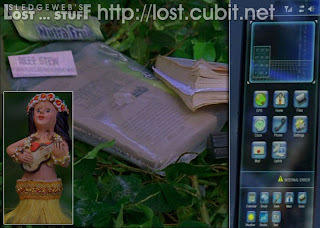 On the way to finding the Pilot, they discover a backpack full of goodies including a Hoola Girl and a Satellite Phone. Sayid's next project anyone? 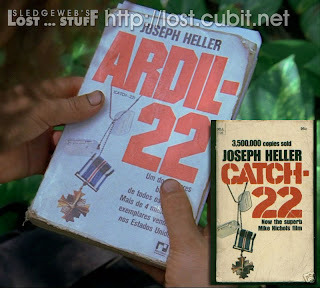 Also among this was a copy of the novel "Catch-22" but it was in Portuguese. Not sure if anyone remembers the season 2 finale with those crazy 2 people in the arctic tracking electromagnetic activity. They were speaking Portuguese. Are we meant to make a connection? I'm going to go ahead and say Yes! Inside this novel was that infamous picture of Desmond and Penny. Now, we only saw ONE picture taken in that pseudo Flashback of Desmond's earlier this season. How did Penny or whoever get a copy of this photo too? Is this something we're meant to harp on. I'm going to go ahead and say "I don't know!" So After all of the Charlie rescuing and clue following is finished, we get all excited at the possibility that the Pilot IS Penny (come on, it could never be THAT easy, could it?) We rip away the helmet...and there she is. Who is it? Woaaaa......It's Sanjaya Malakar fresh off of an elimination from American Idol! Well it makes sense...he WAS in L.A., right?! Okay okay...in all seriousness, who is this lady? Well, for now, we have to assume she has connections to Penny and is, in fact, Portuguese. We have to assume she had the picture to ID Desmond and that's why she knew his name. 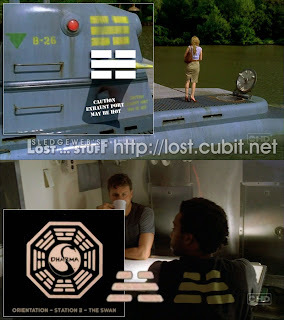 Of course, there is always the skeptics in us that also cannot rule out that it's those crazy OTHERS or some other FACTION on the island messing with poor ol' Dezzy and giving everyone false hope of rescue. More to come on this as we close up season 3! Pretty great episode wasn't it? Well, we all have our favorite characters. Can't help myself...Loving the Desmond! Maybe some people are a big fan of Jin and Sun. Well, we'll be revisiting them next week! And, as predicted early in season 3, Juliet being a fertility doctor will directly affect Sun and her pregnancy. Now, the big question on the table... Did Sun conceive PRE-CRASH with Baldy#2? or did she conceive POST Crash with Newly Fertile Jin? The answer is coming folks! As stated before, it's that time of year when we have to be pondering who will be leaving us this year. We have to think about whose stories are coming near completion. Who is expendable? 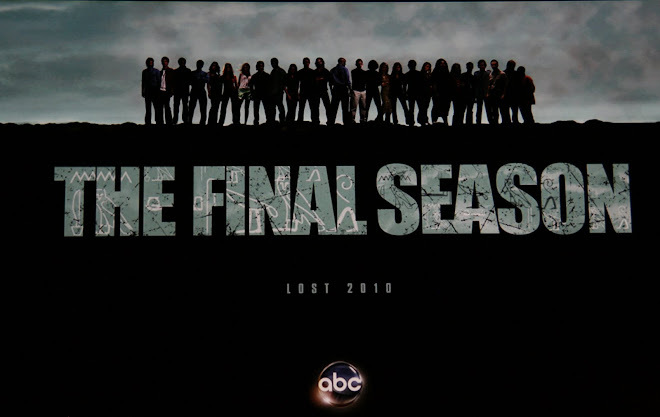 I could name countless others that could be killed off by the end of the season. Charlie's name is floating out there with the whole Desmond premonitions thing. Possibly Sun with the pregnancy. The big question is are Jack, Locke, Sawyer, and Kate invincible at this point in the story? One would really think so. I would also throw Hurley and Claire into the safe zone. And well....they better not be getting rid of Jin! The dude has been funnier than Hurley this season! And like I said before, Desmond better be sticking around too. He seems very important to the entire mythology of the show and his love saga with Penny seems to be just getting started. But what do I know? So who does that leave? Juliet? (she's getting a lot of praise for her role on the show....are they really going to kick her off?) Ben? (possible....if we learn who Jacob is...Ben's role on the show may become meaningless) Tom? (more probable...ever since he was revealed as a non-bearded goon of the others....his role seems less important) Parachute Lady? (oh yeah...she doesn't seem to be a mainstay!) Then there is the question of Michael and Walt. We are told their story will resume in season 4. But Harold Perrineau has just been cast in another TV show. What is going on??? Anyway....just thought I'd do some pondering. Feel free to post your own thoughts on who is the next to go! Okay...upcoming Flashbacks for the remainder of the season. Highlight over the text below if you want to read! Pretty exciting stuff! That's all I have for this week. Hope everyone enjoyed the ramblings. Please post comments and I'll see you next week! Well, they just keep pulling these fantastic episodes out of their arsenal don't they? I'm going go ahead and give "Left Behind" my official "WOW" seal of approval! Started off a little bizarre and I was getting concerned that we'd have another snoozer on our hands. Of course then I saw "Written by Damon Lindeloff" in the credits and was immediately put at ease. This episode packed in a lot of suspense and a lot of girl power between the Kate flashbacks and the Kate/Juliet story. And back on the beach we also got a little light comedy between Sawyer and Hurley with a rewarding ending. This is when the show works best, combining the mystery, suspense and feel-good elements into one episode. 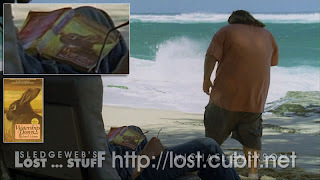 That IS what LOST is all about. Hence, why tonight has me itching for MORE! Before we get started, lots of theories going around that Nikki and Paulo are still alive. I kinda gave a hard stance on this that I couldn't figure out why in the world the producers would WANT to keep them alive and what purpose it would serve. In listening to the podcast and also reading ew.com discussions with the producers it appears that bringing 2 characters out from the background was always an idea they had since season 1. They had ideas of having the Nikki/Paulo storyline extend over several episodes instead of just 1, but due to the fan response....it seems they figured to wrap it all up in one intense episode. One idea they had was for ALL of the flashbacks in Expose' to actually be the TV show Expose' with the reveal at the end of the episode being that it WAS in fact, all a TV show. Personally, I'm glad they didn't go that way. Anyway, producers confirmed in an interview with EW's Jeff Jensen that Nikki and Paulo are definitively, certifiably DEAD. Also they confirmed that Rose and Bernard are alive and well and that a story-arc for the 2 of them is coming up. They also revealed an easter-egg that I missed. In Locke's latest flashback, when he's eating his TV Dinner and watching TV, he is actually watching Expose'! Fascinating stuff, isn't it? In the comments last week there was some intense discussion about the brief flashback to Ben and Juliet in the Pearl station and the fact that they were wearing ragged clothing and barefoot and the fact that this happened on Day 48. If you recall, last season when Eko and Jin went looking for Michael (who ran after Walt)...they came in contact with several of the OTHERS. All we saw was their Feet...and they were all barefoot and some had ragged clothing on. Might be safe to say that 2 of these people were Ben and Juliet and maybe they were on their way to the other side of the island. This is also the date range that WALT appeared to Shannon and Sayid, when Cindi disappeared, when there was whispering in the Jungle. It seems The Others had some elaborate scheme planned for this day and we should be getting a taste of what that was soon. Whew....almost forgot we have a NEW episode to discuss! Let's get to it! Kate runs into Cassidy, a past love of Sawyer's. He had performed the LONG-Con on her but fell in love with her in the process. Cassidy is still seen performing the Jewlery scam that Sawyer taught her. I guess since Sawyer ransacked all of her money, she had to resort to this method of earning income. Kate helps Cassidy out with the scam and in turn, Cassidy helps Kate get ahold of her mother. Patsy Cline's "Walkin After Midnight" is playing in the beginning of her flashback when her car breaks down. It is worth noting that Kate put this record on in the HATCH when she was feeding Sawyer, who was asleep recovering from his bullet wound (Season 2). Kate's wearing a hat that says "COWBOY UP." If you recall, Sawyer told Karl to "Cowboy Up" when they were walking back from the jungle. I'm sure this was just a tongue and cheek reference to that! Kate gets her answer to why her mother turned her in. Even though Kate thought she was doing her mother a favor, her mother thought it was an act of selfishness. Wow...some deep stuff there! Glad we spent a whole flashback on that big reveal! Anyway, the fun part of the exchange was that Kate's mother said the next time Kate tried to come back, the first thing she would do is yell for help. And, if you recall in season 1, Kate does track down her mother, dying in a hospital. Mom keeps her word by screaming for help...which leads to Kate causing the death of her childhood sweetheart. She lives a rough life doesn't she? 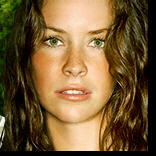 Another confirmation was one left open-ended last year with the introduction of Sawyer's possible Daughter. We thought that Cassidy informing Sawyer that they had a child together could've been a CON. Yet Cassidy came clean to Kate that she was, in fact, pregnant. And one other thing to note. Kate and Sawyer have now both interacted in each other's past through other characters. Sawyer is connected to Cassidy and also Kate's Mother, who was his waitress in the diner at one time. Kate is obviously connected now to the same 2 people. She even had a conversation about Sawyer without even realizing it WAS him. I guess there may be a way for this conversation eventually to happen on the island. 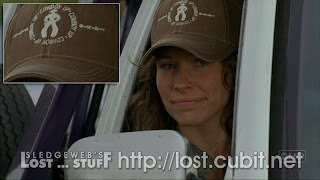 If, for any purpose, it may drive Kate AWAY from Sawyer and in full pursuit of Jack. But this is all speculation! Hunting Boar with Desmond. His angle? Have to give the people something they like. "people like meat" Loved it! Trying to fish. "I can rule out the Korean vote" Fantastic! Also, notice how Sun has been giving Sawyer the stare-down all episode after the reveal last week that her abduction last season was all his fault. Sawyer's conversation with Claire and Hurley telling him to KISS the baby was a good time! The book Sawyer was reading was "Watership Down" which happens to be the first book he ever read on the show. 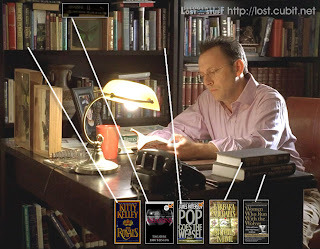 Is he running out of things to read? Or is there some connection we're supposed to make with that episode? I don't remember the exact episode but if it was the "WHITE RABBIT" episode, that is where Jack officially became the LEADER and gave is "Live Together, Die Alone" speech. And as we realized tonight, since the major "LEADERS" on the show are all MIA from the camp, Sawyer has been the "Go To" guy. The whole thing was actually very touching and Sawyer reluctantly embraced his role, as Hurley noted, similar to the way Jack was thrust into the role. Well, Ben seems to have gathered the troops (which we learn that that the Others' Community is about 50 people) and moved out of Othersville leaving a select few behind, in accordance with the Episode Title. Those left behind? Jack, Kate, Sayid, Juliet. Not left behind? Mr. John Locke. The majority of the story is following Kate and Juliet around in the jungle with some great dialogue and action. But the whole strategic move on Ben's part is worth discussing. Let's note some things below! In Tom's Rec-Room, where Kate is being held hostage we see a glimpse of the board-game Mouse-Trap. 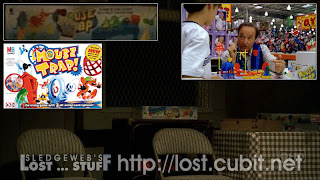 If you recall, in a season 1 Locke flashback, he is explaining the game to a kid while working in a Toy Store. Could be an allusion that the whole plan set forth in this past episode is, in fact, luring prey into a trap. Really depends on how you view Juliet and her intentions. Supposedly the 4 left behind were all gassed but only Kate and Juliet were placed randomly in the jungle hand-cuffed together. I'm getting ahead of myself, but how did Juliet know where Sayid and Jack were when they got back? Seems a little fishy if she was just as much in the dark as Kate. 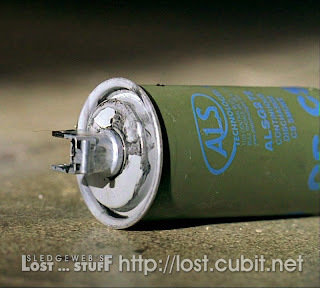 Feel free to get a closer look at the canister of gas. Apparently, it is a real-world brand, so I don't see much to look into! Juliet makes a note that Ben has a love for playing Mind Games. I think we all are aware of this by now. Of course, we still don't know when he's playing games and when he isn't! But if you take Juliet on her word, then she could be IN on this game. But at the same time, it's so easy to want to believe her! In an interview with Elizabeth Mitchell (Juliet) on the podcast, she says that we will soon be learning how she went from a paranoid and unsure individual (pre-island) to the confident Juliet we've come to learn on the island. Maybe they'll reveal to us how she learned how to FIGHT as well. How about that crazy cat-fight Kate and Juliet had? They were all over the place. It kinda reminded me of how strong Ethan was when we saw him in season 1, and even when Ben beat the crap out of Sawyer when he was in the cage. What are these OTHERS eating??? Also, the fact that Juliet's arm has been dislocated 4 times before is probably something worth noting. Of course the fight all got started because of Juliet's interrogation of Kate's intentions to go back for Jack. The "You broke his heart" reveal was quality stuff. Will be interesting to see how the LOVE Rectangle develops from here! So, again we see what many have started referring to as "SMOKEY THE MONSTER." I think it's a bit cheesy to call him Smokey, but damn it's catchy! Of course, this time we see some different elements of the monster. I'm not sure I saw what this photo shows, but it would seem that the monster took the form of a 3 headed monster. And if you recall your Greek Mythology, there is the 3-Headed Guard Dog of the underworld, CERBERUS. 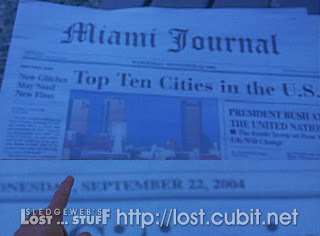 And if you recall even further on the Glow-in-the dark Hatch Map, there was a reference to CERBERUS. This could be confirmation that the smoke monster was what this Map reference was referring to. Examine the pictures for yourself! I thought it was interesting at first when Juliet was claiming that this was the first time she saw the monster. But then it seems it was confirmed that the Sonic-Force field surrounding OTHERSVILLE was for Protection AGAINST the monster. I guess what the big reveal is, is that the OTHERS and the Smoke Monster are completely unrelated. This kinda goes into play with Ben looking for information from Locke about the island's powers. 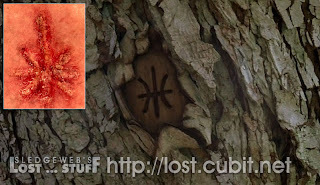 The Others just seem to be another faction of people living on the island but do not hold the answers that we all seek. Well, we had to know this is the way things were going, right? We have 2 or 3 more seasons to go! BUT then again, if we are to believe that the Smoke Monster and the Manifestations on the island are one of the same, and that Ben somehow has Locke's father in captivity and that THIS is somehow related to manifestations....well then something just isn't adding up! But apparently, by the first week in May, we'll have a little more understanding of all of this! Speaking of Locke, how about him just giving up on everyone else and following the Others? He "put in a good word" for Kate about being a "Good Person." But once he learned what she did, then he seemed to be on board with the Others that she deserved to be "Left Behind." Maybe Lock is following them for the greater good and will end up pulling some heroic stunt. But it seems this man just wants some answers. And of course, I'm sure there is some motivation with seeing his father. (who am I kidding? It might be his ENTIRE motivation) No doubt there is much more to learn in this story! So eventually Juliet and Kate get back to Othersville and get Jack and Sayid. Kate apologizes to Jack and Jack reluctantly says it's time to go BACK. Wow...past the midpoint of the season and Jack is finally returning to the camp! But they're not going alone....Juliet is going with them immediately causing some problems for Sayid. 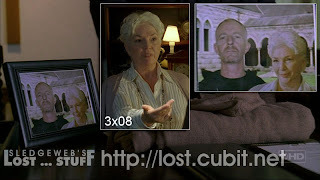 It is possible that Juliet is part of a Ben master-plan...there is plenty of evidence in this and prior episodes to support that. Yet there is also evidence that she is just as helpless as the rest of them which is what Jack wants to believe. There is also the possibility that Juliet is looking out for herself and has her own motivation for going to the other camp. In any case, it looks like we're going to get some of these answers pretty quickly. Because next week it looks like Jack and crew will return to the Camp! Let me ask you this....every other time we have survivors trekking across the island, it takes 2 or 3 episodes to get there. Why now is this going to just happen instantaneously? Couple things I can think of....Juliet is aware of a short-cut or the producers are aware of the frustrations of the viewers with taking too much time to advance plot...so they're taking some liberties with travel-time. Or maybe some combination of the 2? In any case, it looks like next week will be a more revealing look at the OTHERS. Could it be the episode we have been waiting for? Maybe partially. Seems like it will have to be another Juliet flashback. I am starting to think that the season 3 finale episode will be a 2 hour BEN Flashback, kinda like Desmond got the nod in Season 2. So between these 2 episodes, maybe we'll learn all there is to know about the mysterious OTHERS and move onward to the next big cliffhanger. Here's a question for you...with all of this "CHARLIE DYING" stuff going on, when are we going to get a Charlie flashback? He is the only original castmember to still have no flashback under his belt this season. And hopefully it's a better story than the dreadful "Fire + Water" Baptism episode last season! I'm going to guess his flashback will happen sooner than later. Whew...well somehow I still found a way to get to the blog today, but I'll continue posting my warning that it may be getting later as the weeks go by. Hope you enjoyed my ramblings and as always, I look forward to hearing yours! See You Next week!